It would be perfectly natural if after looking over the Modern Masters 2017 set list last week, you found yourself wondering “how am I going to make money on Modern this year?”. And while the surprisingly solid starting EV (Estimated Value) of MM17 boxes has set off the usual round of doomsaying with regards to the viability of Magic finance, the nimble minded among us should have relatively little trouble finding a way forward. After all, the set does have value well distributed between the mythics, rares and uncommons, but the print run is likely to torpedo the EV in the coming weeks, and plenty of relevant cards were left out. This week I’m going to kickoff a three-part series, starting with an examination of the cards from MM17 that are most likely to make us money if we get in at the lows. Note: Crystal Commerce, the software many vendors use to manage their inventory has been causing issues with TCGPlayer inventory this week, so I am referencing Ebay BIN prices and StarCityGames.com pricing as well as TCG & MTGPrice Vendor Team prices posted for now to get a handle on price movements. Generally speaking you can expect prices to fall further once the set is actually released and we start the slog towards peak supply with sellers undercutting each other left and right. MM17 mythic pricing has already fallen off hard in the last week. In just a week, the MM17 mythics have shown an average decline of 22%, and if we look back to Dec 1st/16 (when the market was already anticipating the inclusion of many of the Innistrad and Return to Ravnica staples), we see that the average decline has been 42%! That’s a pretty steep cliff if you were holding these cards in decks on the basis that you play with them. For instance, if you owned a playset of ‘Goyf, LOTV, Cavern and Snapcaster, and held through the ramp up to the set, you’ve already cost yourself $350+! It’s going to be pretty tough to justify that inertia on the basis of getting access to some other staples you need for a deck or two at a cheaper price, but for a new Modern player things are certainly looking up. And the thing is, we’re just getting started. 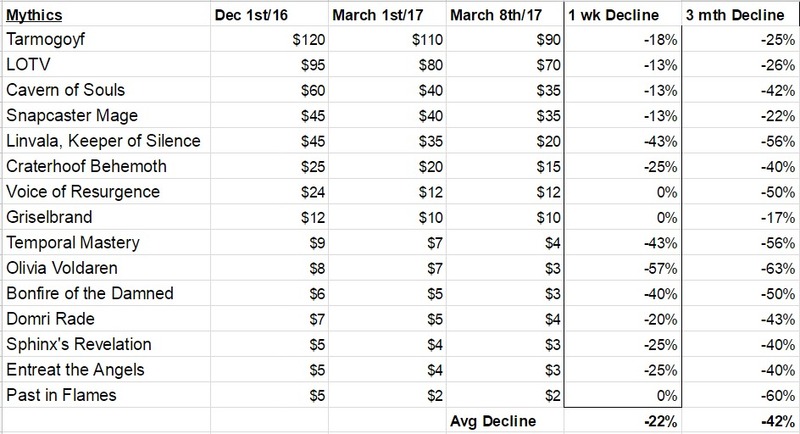 Whether or not MM17 has been printed 1.25x, 1.5x or 2x the amount of MM15 we saw (which is still in the marketplace well below MSRP), prices today are still going to look optimistic vs. where they are likely to end up once the set starts getting opened. I expect a further 10-15% decline minimum on the mythics. 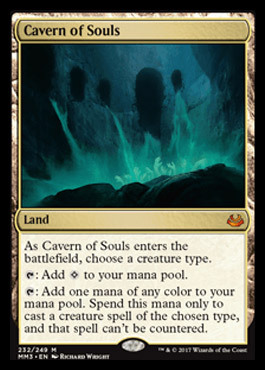 Given all of that, my top pick at mythic out of MM17 so far is Cavern of Souls. Cavern of Souls is the poster child for open ended synergy, benefiting decks that are tribal focused and either a) multi-color or b) in need of counter-spell defense. The card is nearly always played as a four-of, it sees play in multiple archetypes in Modern and Legacy, the card has legs in casual, the new art is sweet, the foils are likely to be stunning and it’s a card that some folks like me already offloaded and will be looking to pick back up. It’s also been confirmed that a strongly tribal themed set is in the pipeline (Azatlan?) and Cavern will certainly be useful once that appears. 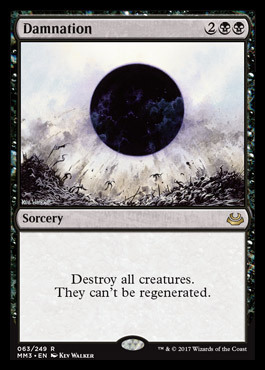 This is the first reprint for the card and I don’t think this card is likely to be a priority for MM19, though there are no certainties that far out. Liliana of the Veil is the 14th most played card in Modern, and is often played as a two or three-of. This is her first non-promo reprint, but I could see her ending up in Modern Masters 2019 again, where they may have significantly less fresh meat for the grinder given the relative lack of new Modern relevant mythics from the last few years. LOTV is one of the most iconic cards of the last decade but I well remember picking her up at $55 in the winter of 2015, a price I think she can fall beneath in the next few months. I suspect $45-50 copies will be available and that they may recover to $65-70 in the next twelve months. Past that point MM19 casts a scary shadow, so the window will be tight to make the spec worthwhile, unless you need some to play with. 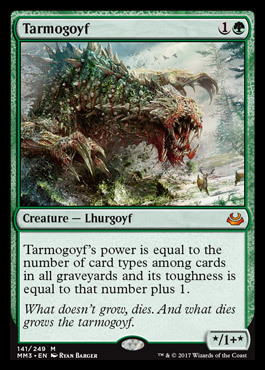 Tarmogoyf is now on its 3rd reprint in five years. There is no doubt the card is a powerhouse, but surely there is a limit to how many times something can be printed without tanking semi-permanently. On the other hand, ‘Goyf is the 5th most played card in Modern and the 6th most played creature in Legacy, is nearly always played as a 4-of, and is played in multiple archetypes providing resilience to meta shifts. It is worth noting that the best green creature in Modern made it from $115 around Modern Masters (2013) to $200 before the 2nd reprinting in Modern Masters 2015 (which was a surprise at the time), but it’s been basically all downhill from there and finding the bottom this time is going to be tricky given how much inventory was already on hand heading into this latest printing. In the past vendors have tried to defend the price of this card with aggressive buy listing but that time is likely past. I fully expect copies to end up available between $50 and $60 at peak supply and truly I see this as an opportunity to own for play more than a great spec. If MM17’s print run ends up as deep as I fear it is, or if a fresh wave of inventory is made available to vendors later this year, I won’t be prioritizing this card beyond the personal playset I’ve held off on for years. 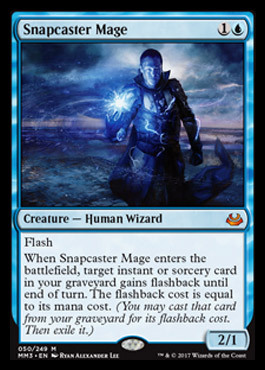 Snapcaster Mage was a bit of a surprise at mythic instead of rare, and as such, is more likely to show gains down the road. The card has a promo printing behind it and is the 19th most played card in Modern, showing up in 12% of decks and usually played as a 4-of. In Legacy it’s the 11th most played card, showing up in 25%+ of decks at an average of about three copies. Those are great stats, but this could easily show up in MM19, so the window is likely to be tight here as well. Currently selling at $35, I suspect you’ll get a shot at these closer to $25 and if you can get a couple of playsets near $100, I think you’ve got a solid chance exiting closer to $160 minus fees, especially if MM17 availability is scarce come the end of the year. In contrast, 70% of the people I polled on Twitter preferred the original art, so I’m more likely to target those than the new version once we get to the lows. 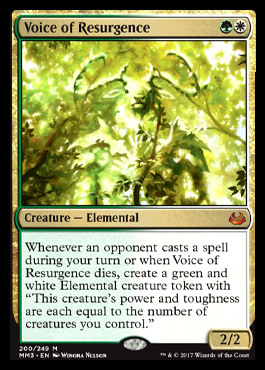 Voice of Resurgence is just barely in the Top 40 creatures in Modern, but keep in mind that this card has already fallen $30 (75%) in the past year on modest play patterns and anticipation of this set. When the card is played it is often as a 3 or 4-of and W/G decks featuring this card alongside Renegade Rallier have been popping up lately. If blue-based control finally turns the corner in Modern, that would also help boost demand for this counterspell hoser. Once Voice gets below $8 it will have my attention and at $5-6 I’ll definitely take action. Some of the other mythics feature a fairly limited demand profile and I strongly recommend exiting asap. Linvala, Keeper of Silence has already cratered from $45 to $20, and I think it could hit $10, as the play pattern in Modern is very shallow. Grislelbrand has some potential if he gets to $6, but his climb back up from the combined suppression of his GP promo and this printing may take a while. 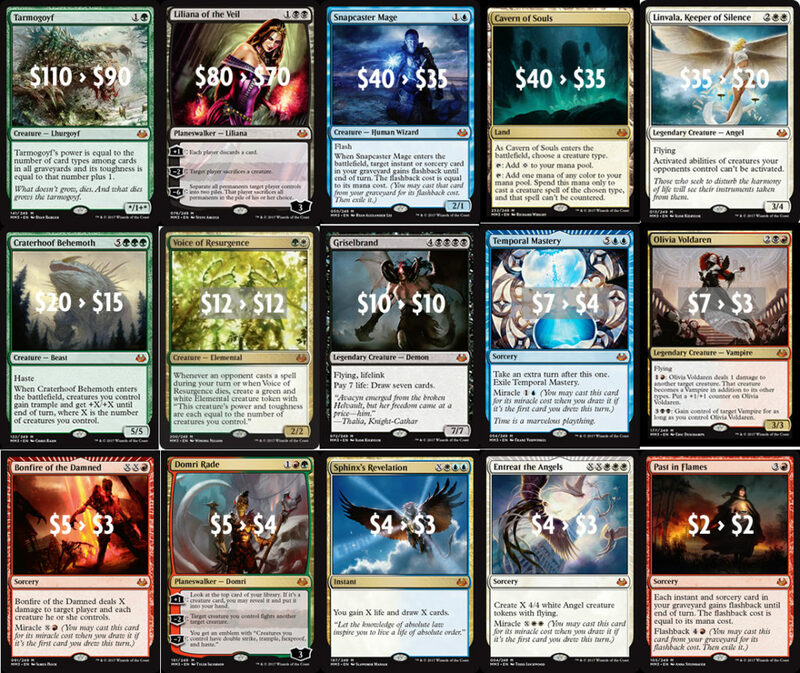 Most of the rest of the mythics already under $10 are equally unexciting, though if I’m pushed I would say that Craterhoof Behemoth near $10 (a strong EDH staple), Sphinx’s Revelation near $2 and Past in Flames at say $6/play set might get a bit of my spec flow when the time is right. MM17 rares are displaying massive drops in price over the last week. Digging deeper, if we look back to Dec 1st/16, the story is even darker. Note: I used post-spike pricing for both Basilisk Collar and Death’s Shadow since their price 3 months ago wasn’t particularly relevant. I missed Cyclonic Rift in this list as well. Keep in mind that these prices are pre-order period pricing, which tends to be significantly higher than the prices we are likely to see 3-6 weeks from now as peak supply on MM17 is achieved and Amonkhet starts to steal the focus (and the money) away from this set. 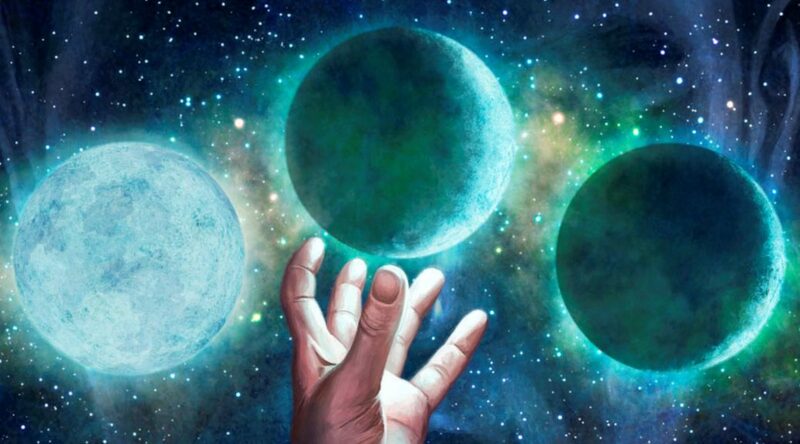 As with the mythics, deciding where to get in and what to get in on is largely a function of how deep the print run goes, but we can apply similar principles as above to select some likely targets. Anyone telling you that you should get in on these lands at current pricing needs their head examined. The price memory on these cards is going to be soft because despite their inflated value heading into this scenario, they were printed at rare. Had they been printed at mythic rare, they might have held closer to their old prices, but you’ll be better off if you erase past expectations and work with an eye to the future. Like some of you, I’ve been awaiting an entry point on a few of these for personal use for at least a couple of years, but trust me, there isn’t a rush to jump on pre-orders. There are going to be an average of two of these things in every box of Modern Masters 2017 and there are going to be 10,000-20,000 boxes of this set sold in North America alone. 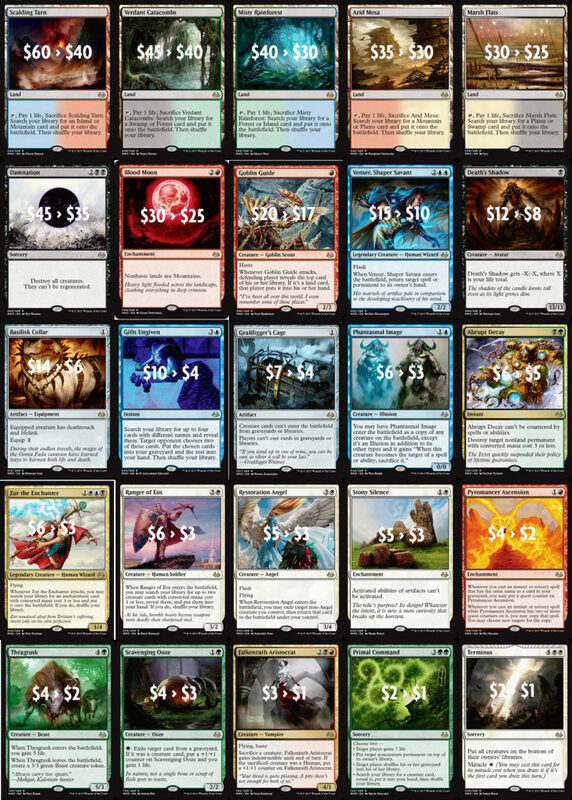 That’s a minimum of 20,000 new fetches entering the market, or 4,000 play sets of each. That means 1,000 players each get a shot at a set, and despite the average drop off in value in the mid 40% range since December, I don’t think we’re done yet. As of today, StarCityGames wants $45 for a Scalding Tarn. 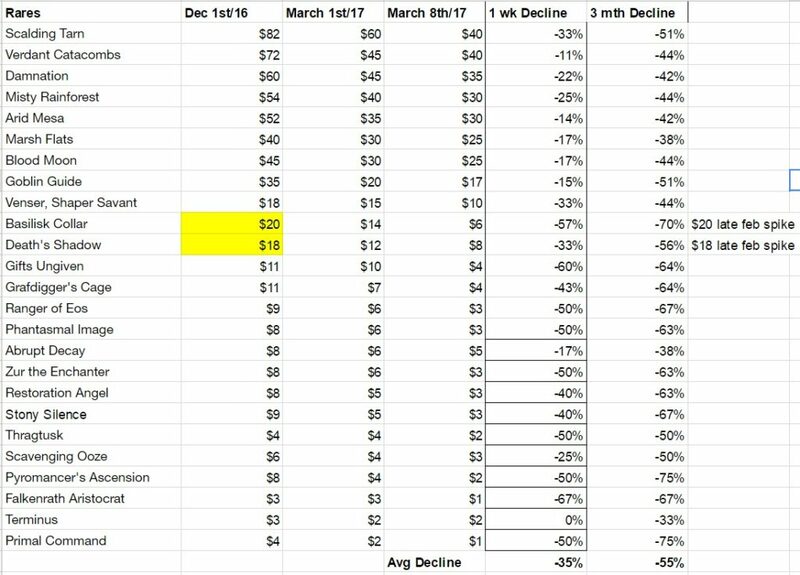 That tells me that TCG NM Low is likely to be closer to $35, and that deals via social media are going to touch $120/set or lower. I consider this math to be conservative. If there’s more like 40,000 boxes sold, the lows will be lower. As far as speculation targets, Scalding Tarns and Verdant Catacombs are most likely to continue their popularity regardless of the specific meta, but all of these are solid pickups if they get low enough and you have personal use for them. It’s worth reminding you here that Khans of Tarkir fetches have been mostly shallow gainers, though Polluted Deltas and Flooded Strands I bought at $10 are now closer to $15. Still, whether MM17 is 1.5x or 4x the print run of MM15, there’s still a big difference between a globally released fall set and an LGS only set with an MSRP of $10/pack that’s printed in just three languages. If the foiling in this set is as bad as MM15, original foils may be gainers, but they do have the hard ceiling of the Expedition versions capping their progress. Without knowing just how much inventory is in the pipeline I’m not in a rush to get more than a personal play set. Let’s revisit options once we’ve got some pavement behind us before going deep here. People were joking about Damnation not getting a reprint for so long that they lost sight of just how shallow the demand for this card actually is. It doesn’t rank in the Top 50 spells in Modern, let alone the Top 100 cards, and is most often played as a one or two of. There is some demand from EDH but in the end, this is a Wrath of God, and pricing on this class of cards has not been kind to reprints. SCG is currently looking for $35 on this card, but copies are already posted under $30, and I will be stunned if it’s doesn’t drop under $20 when all is said and done. In fact I feel strongly enough about this card dropping that I’m tempted to sell them now at $30, and fill those orders with copies I buy in a few weeks at $20 or less. If you need this card for a deck, grab one at lows, but I hate it as a spec. 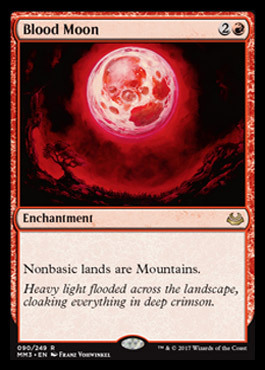 On the one hand, Blood Moon is a devastating card that hammers reliance on non-basic lands in Modern so hard that it gets main decked in multiple decks. It’s in the Top 30 spells in the format, appearing in 13% of decks but only averages two copies in the decks that want it. It’s been four years since it last showed up in Modern Masters, after which it gained popularity and topped out over $50. On the other hand it is on a short list of cards that many Modern players feel the format would be better off without and carries a slight chance of being banned. All in all if it gets low enough I’ll pick some up, but it’s not a priority. 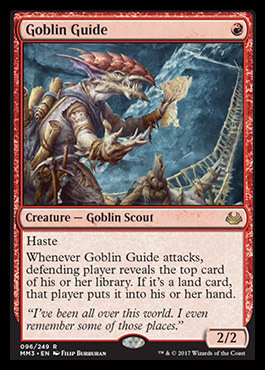 Goblin Guide is one of the Top 25 most played creatures in Modern, but doesn’t have much demand beyond that. 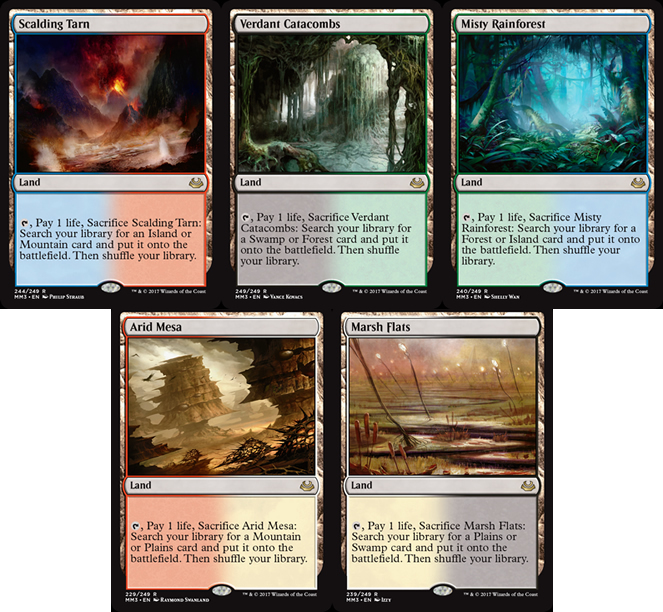 I consider the original art from Zendikar superior to the new art, but tastes may vary. The card is a staple creature in Zoo and Burn decks, and almost always played as a 4-of. Copies are already out there for $17 or so, so I expect that a $50 play set is almost certainly doable in the coming weeks. The lower it gets beyond that point, the more interested I get as the decks it fits in are some of the most common entry level decks in the format and the card has an essentially zero chance of being banned and a very low chance of falling out of the format permanently due to a meta shift. It’s worth noting here that at $12, even after a 100% gain in the last few weeks, Eidolon of the Great Revel might be the better pickup since supply has been draining and it is highly unlikely to show up before MM19. Most of the rest of the rares are going to be sunk for a long time, but very low pricing on Death’s Shadow, Abrupt Decay and Pyromancer’s Ascension might grab my attention. Other cards like Basilisk Collar, Scavenging Ooze and Stony Silence are either reprinted to irrelevance or corner case cards that can’t handle all the fresh supply. In terms of uncommons, Path to Exile, Inquisition of Kozilek and Serum Visions have shown a resistance to reprintings in the past, but you can sit back and look for a deep low before making a move there and the returns are likely to be minor regardless. When scouting for entry points on all of this, I recommend two specific periods of review. First, look to the week after release for the initial flurry of buying interest to be overcome by building inventory, leading to a serious race to the bottom, especially on the cards with weaker overall demand. Some people that bought in hard on boxes and cases on spoiler news will be panicking when they realize this is going to be a buyers rather than a sellers market, and deals will be had. The next period I would be targeting would be Amonkhet spoiler season through to the week after that sets’ release. I expect that set to be impressive, and even if it’s only average it is going to steal attention and wallets from MM17. Join me next week when we follow up on the Modern cards that weren’t reprinted in MM17 that are already on the move or may do so down the road. Any comments on the CrystalCommerce incident in terms of finance? Seems to me that could lead to short term buy opportunities. Maybe that is enough justification to buy the non reprinted staples early next week on Tcgplayer or the like since people won’t buy for the next several days dye to inaccurate price fears. The impact of removing a bunch of sellers has been to raise, not lower, average prices, so I’d let that get back to normal before making a move there.